Only do these exercises if you have been advised to do them by your physical therapist. The wall sit is a gateway to functional squatting. It is appropriate for anyone experiencing patellofemoral pain or front knee pain. Start: Place your back against a wall with your feet out away from the wall. You will slide down the wall until you are in a sitting position. You want this to be pain-free. You should not go further than 90 degrees and make sure that your knees are aligned with your ankles. You can perform a "Sit and Hold" and hold the wall sit for 30 seconds plus for a number of sets or you can perform multiple repetitions, 3x10. This is a progression of the bridge. 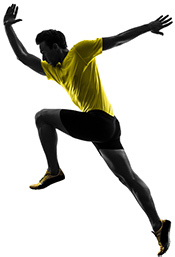 It is a great way to increase strength and stability of your legs. Start: On your back with the theraband around one foot that will be in the air. Holding the theraband, lift your hips up to the ceiling and hold for 5 seconds. Return to the ground slowly to tap your bottom down and then push back up. Perform for 2-3 sets of 10-15 repetitions. This is a more advanced version of a standing lunge. Using a weighted ball or a dumbbell, lunge forward as you twist your torso from your opposite shoulder toward the outside of the front leg. Repeat 15 x 3 sets per leg. Awesome self mobilization technique for shinsplints. Starting position: place lower leg on foam roll, prop up on arms. Ending position: roll along the anterior tibialis, the muscle in front of your lower leg. These are great exercises for runners and cyclists to do before and after workouts. Altering the alignment of hip and pelvis is a great way to isolate medial and lateral hamstrings while stretching. It's important to do this stretching exercise to prevent low back, hip, and pelvis pain. Great stretch to do at the office or after running or cycling. To make sure you feel the stretch, do a backward pelvic tilt. Hold for 30-45 seconds, taking deep breaths. Do both legs. Keep your knee pointing straight down.